Crewel Embroidery Kits make it easy for beginners and experienced stitchers to create beautiful handmade needle art for the home. Kits include foundation fabric, yarns, needle, and instructions. Crewel needlework is a style of free hand embroidery that uses a variety of decorative stitches and different types of yarn to create a textured effect on woven fabric. 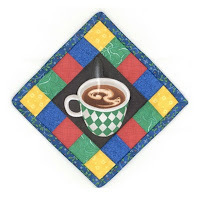 Our newest selection of kits are colorful and creative crewel embroidery designs from Dimensions. You'll find them in the Crewel Embroidery Kits section of the store! 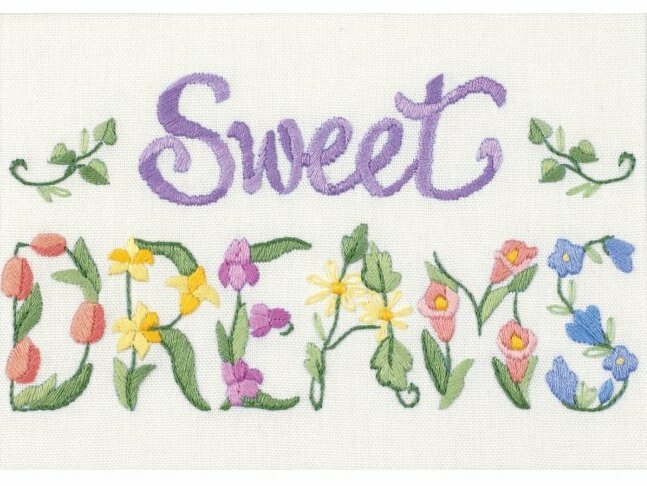 The Sweet Dreams Crewel Embroidery Kit includes printed white cotton/poly sailcloth, needle, pre-sorted cotton thread, and instructions. The crewel embroidery pattern is pre-printed on the foundation fabric, so you'll be ready to start stitching right away. The flowery Sweet Dreams design would be a lovely addition for baby's nursery or a child's bedroom. Mini crewel embroidery kits stitch up quickly and are perfect for handmade gift giving! The smaller size also makes them an ideal embroidery project for beginners just getting started in crewel work. 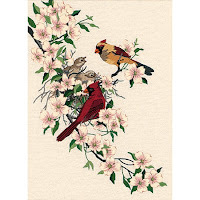 The Cardinals in Dogwood Crewel Embroidery Kit includes printed wheat cotton homespun, wool yarn, cotton thread, needle, and instructions. All of the yarns are pre-sorted on a convenient thread organizer, saving you the time of sorting out all the colors. This is a very nice new feature that Dimensions is including in many of their embroidery kits. 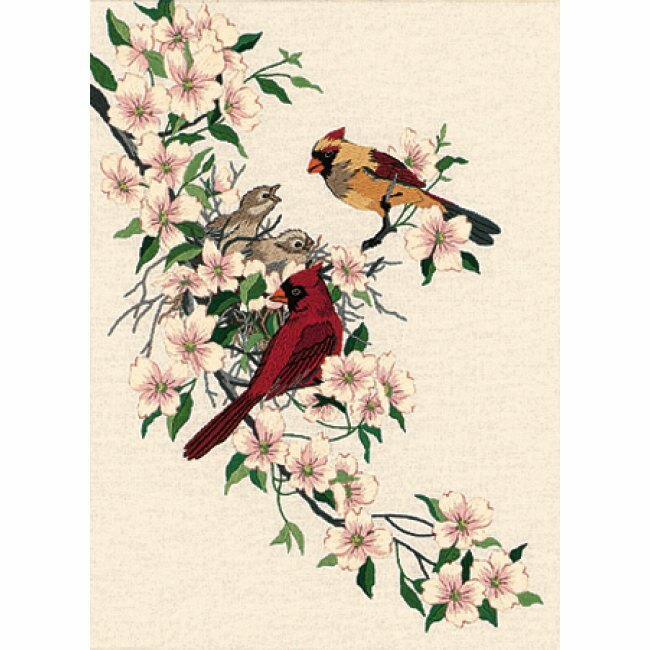 Cardinals in Dogwood is an elegant embroidery design celebrating a family of cardinals at home in the branch of a flowery dogwood tree. This is a great project for an advanced beginner or intermediate level embroiderer. You only need a couple basic Embroidery Supplies to complete your crewel work projects, including a pair of scissors for snipping threads and an embroidery hoop to hold your fabric while stitching. 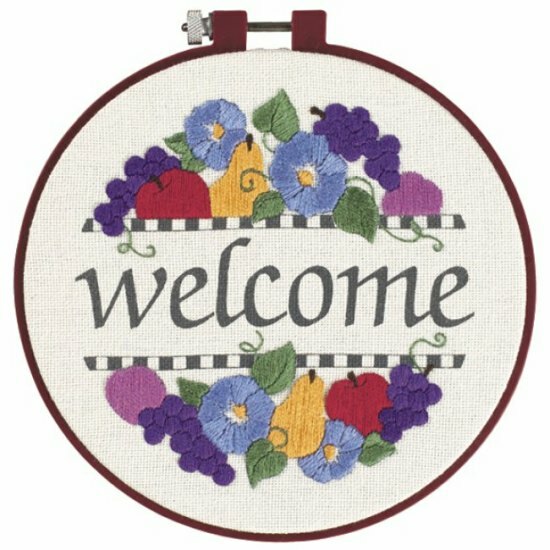 If you're a complete beginner, you won't want to miss the Summer Welcome Learn-A-Craft Crewel Embroidery Kit from Dimensions. Kit includes pre-printed ivory cotton homespun, a 6-inch plastic embroidery hoop, pre-sorted cotton thread, and easy instructions. Simple designs and step-by-step instruction make Learn-A-Craft Kits a great choice for beginners wanting to learn a new craft! Visit the Embroidery Kits section for details on these kits and to see our complete selection of hand embroidery kits for all skill levels, including crewel kits, cross stitch kits, and more. Weekend Kits is dedicated to offering quality products and the very best in customer service. Explore our colorful selection of Art & Craft Kits and be ready for your next creative Weekend at Home! Creative & Crafty Gift Giving Ideas for Kids! 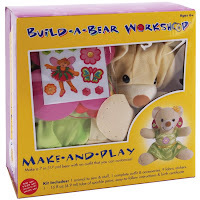 Kid's Craft Kits are perfect for holiday & birthday gift giving. 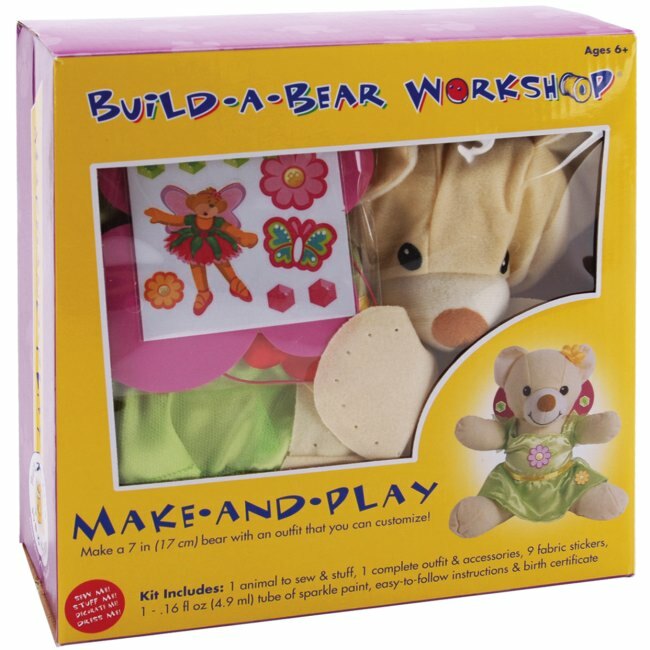 Craft activity kits include all the materials & instructions kids need to learn a new craft and create something new! See our complete selection of creative craft kits designed specially for kids in the Kid's Craft Kits section of the store. Here are a few of our newest arrivals, here just in time for the holidays! 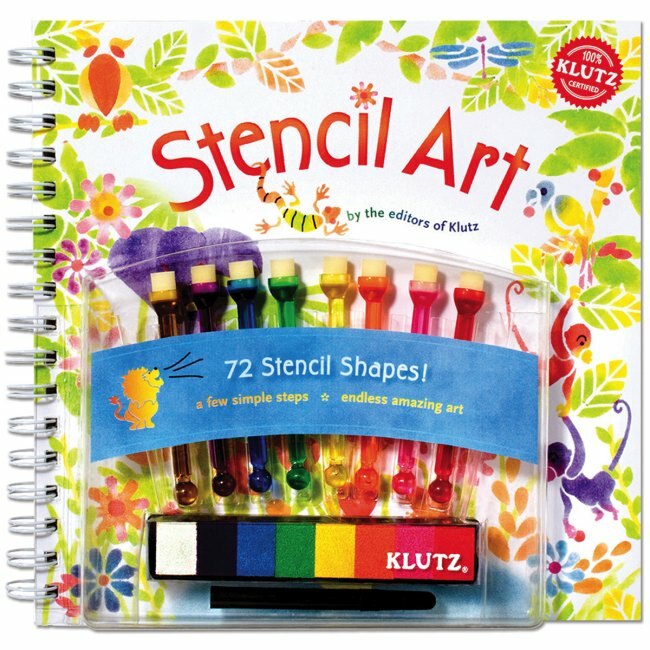 The Stencil Art Kit from Klutz includes a full-color instruction book, 8-color pigment ink pad, 8 foam-tip dabbers, 1 black felt-tip pen, and 4 pull-out stencil pages. This kit includes with a generous variety of stencil shapes in themes that kids will love! The 54-page book includes clear instructions that make the process of creating stencil art easy & fun for kids. A very nice feature of this kit is that the book contains plenty of pages specifically designed for kids to fill in with their own stencil art! 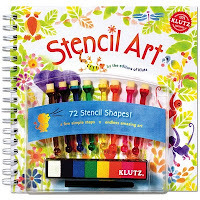 This is an awesome art kit for kids ages 8 & above. The Klutz Origami Kit is yet another amazing craft kit from Klutz. 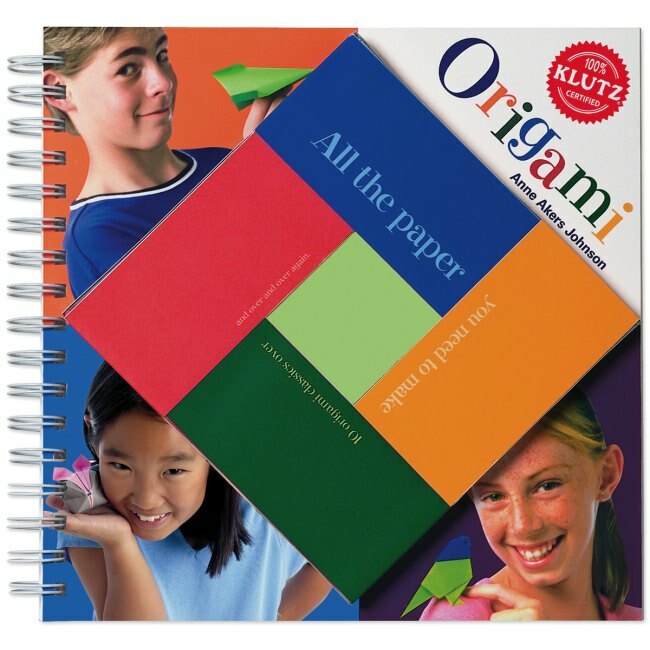 The quality of instructions is what really sets Klutz kits apart from others and the 85-page full-color Origami book is no exception. Detailed step-by-step diagrams take the confusion out of learning how to create 10 origami classics. This kit also includes 80 sheets of origami paper inside a handy origami-style storage box right on the front cover of the book. Kids ages 9 & above will have fun learning to make these origami favorites, including a hopping frog, parrot, airplane, star box, and secret letter. The Ornament Kid's Kraft-It Kit from Karen Foster is a creative holiday craft kit for kids to make a festive 3D decoration. Kit includes 2 heavy-weight chipboard shapes and plenty of stickers for decorating! The colored shapes interlock together to form a 3D Ornament centerpiece. 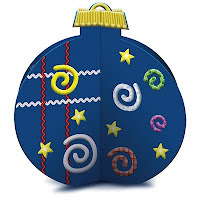 Kids apply the stickers and create their very own holiday decoration! This is an easy craft kit for grandparents to have on hand for when the the grandkids come to visit this holiday season. It's also a fun make-and-take craft kit for a kid's holiday party. 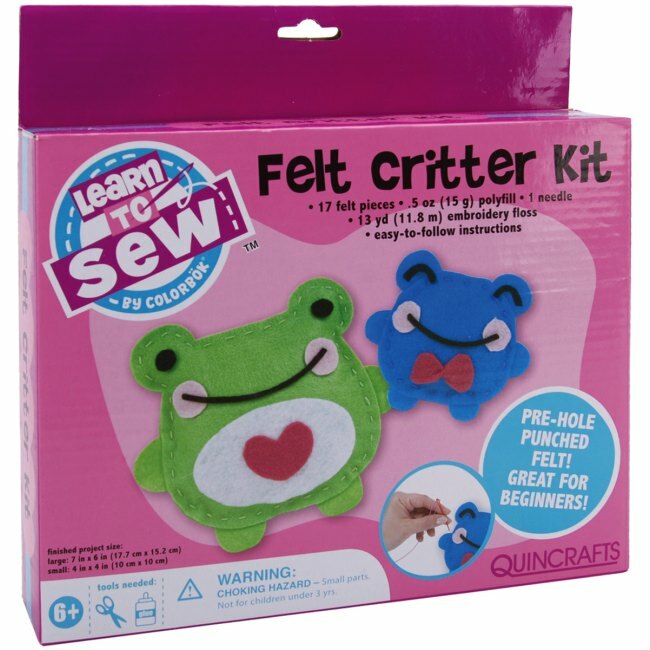 Visit the the Kid's Craft Kits section for details on these kits and to see our complete selection of craft kits for kids, including kid's sewing kits, knitting kits, weaving kits, jewelry kits, and more. Let Weekend Kits be your one-stop shop for crafty holiday gift giving. You'll find a full selection of craft kits for adults, teens, and kids. Stop by today and be ready for a craft-filled Weekend at Home with family & friends! 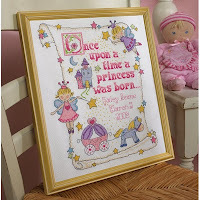 See our new selection of Cross Stitch Kits for Baby! These embroidery kits include all the materials you need to create an heirloom baby quilt and matching birth record for baby's nursery. 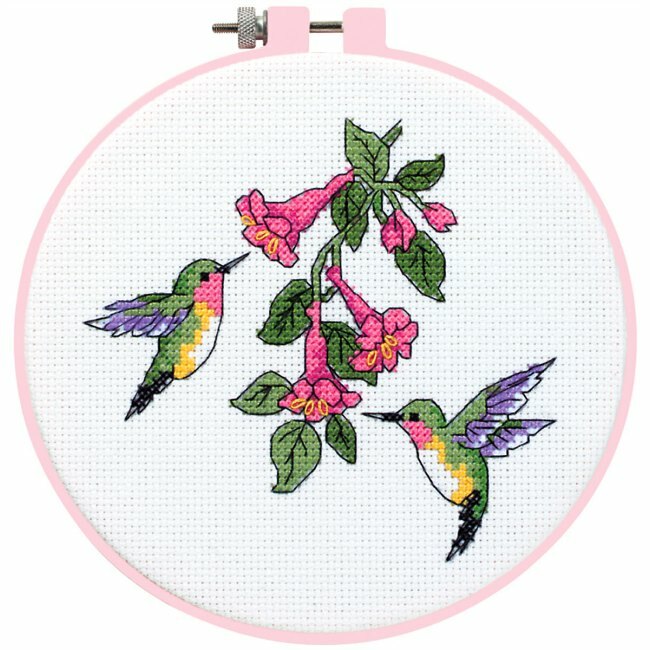 You won't want to miss these creative new cross stitch designs from Dimensions and Bucilla. You'll find them in the Embroidery Kits section of the store! 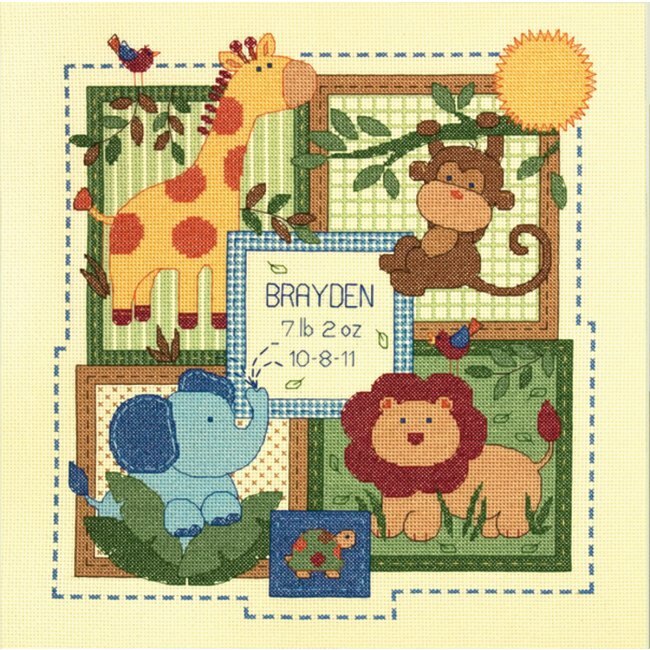 The Savannah Baby Quilt Kit is an adorable safari-themed stamped cross stitch kit from Dimensions. 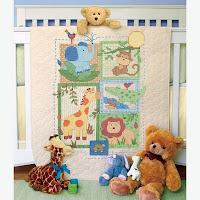 Baby jungle animals, including a giraffe, monkey, elephant, and lion, are cross stitched in modern colors on this sunny quilted baby blanket. Kit includes a pre-finished stamped baby quilt, presorted cotton thread, embroidery needle & instructions. This kit includes a convenient thread organizer with all of the embroidery floss pre-sorted by color code. Stamped cross stitch kits come with the design pre-stamped on the front of the quilt in wash away ink. No need to transfer any patterns. You'll be ready to start stitching right away! The matching Savannah Baby Birth Record Kit is a counted cross stitch kit for you to create a hand embroidered birth announcement for baby's nursery. Kit includes 14 count ivory Aida fabric, presorted cotton thread, embroidery needle, chart and instructions. Counted cross stitch kits don't come with pre-stamped designs. Stitches are placed by following a chart and counting squares on the woven foundation fabric. 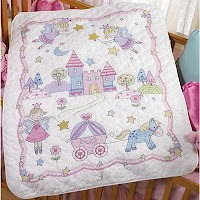 The Princess Baby Quilt Kit is a delightful princess-themed stamped cross stitch kit from Bucilla. This happily-ever-after quilt design is cross stitched in soft shades of pink, lavender, and blue. Kit includes a pre-quilted stamped crib cover, cotton floss, needle, and instructions. 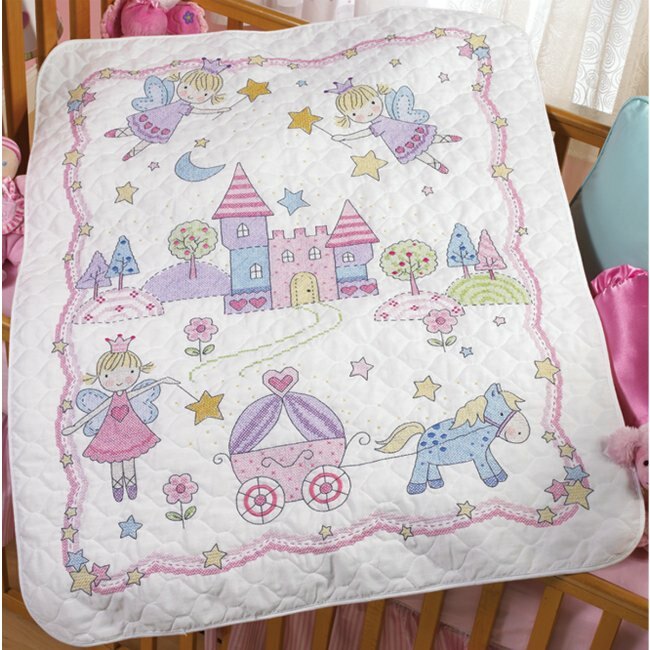 Quilt design features fairy princesses, a horse drawn carriage, and castle. The perfect choice for any new baby girl! The matching Princess Baby Birth Record Kit is a counted cross stitch kit for creating a beautiful needle art birth announcement. The words "Once upon a time a princess was born..." are followed by baby's name & birth date. You'll need basic Embroidery Supplies on hand to complete your cross stitch projects, including an embroidery hoop and scissors. Visit the Embroidery Kits to see our complete selection of cross stitch kits for all skill levels, including stamped cross stitch kits, counted cross stitch kits, and beaded cross stitch kits. Weekend Kits offers a completely unique selection of Creative Craft Kits & Supplies across a wide range of Arts & Crafts categories. Stop by today and be ready to start cross stitching for baby on your next Weekend at Home! Holiday Crafting Made Easy - Christmas Craft Kits! It's time to start crafting for the holidays! Christmas & crafting just seem to go hand in hand, so as we begin to approach the holiday season, crafters of all ages are ready to start creating. Crafting for the Holidays is easy with kits that have all the materials & instructions you need to complete your project. You'll find our newest selection of seasonal kits in the Christmas Craft Kits section of the store! Here's a great new addition to our collection of felt Christmas stocking kits. 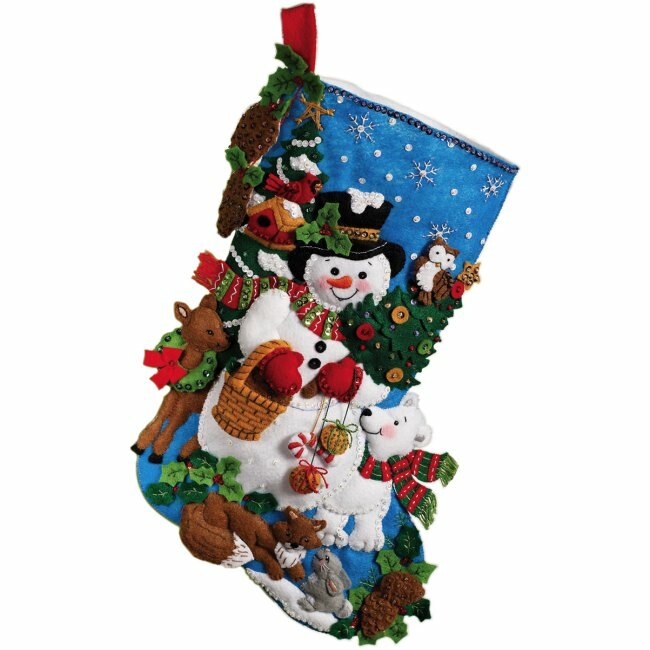 The Snowman Felt Stocking Kit is a brand new stocking design for the 2010 season. This is a quality kit from Rachel's of Greenfield. This complete kit contains the materials and instructions you need to create a traditional woolfelt stocking. Kit includes felt for the stocking & applique pieces, cotton fabric for the trim, as well as embroidery floss & buttons for embellishment. You'll also receive complete patterns for cutting out your felt pieces and step-by-step instructions with diagrams that guide you through the sewing & applique process. Everything you need to make a traditional woolfelt stocking with homespun fabric and quality felts! The Holly Jolly Card Making Kit is a merry new Christmas Card Kit from TPC Studio. All the materials you need to make 8 unique holiday greeting cards for family & friends! Kit includes 8 folded cardstock cards, cardstock punch-out sheets, chipboard sticker sheet, rub-on sheet with jewels, envelope liners, envelopes, and easy card making instructions for beginners. Christmas card making is a fun Make & Take group craft activity for holiday gatherings. Lay out all the materials from this card making kit, along with a few basic card making supplies, and your guests will be ready to start crafting! 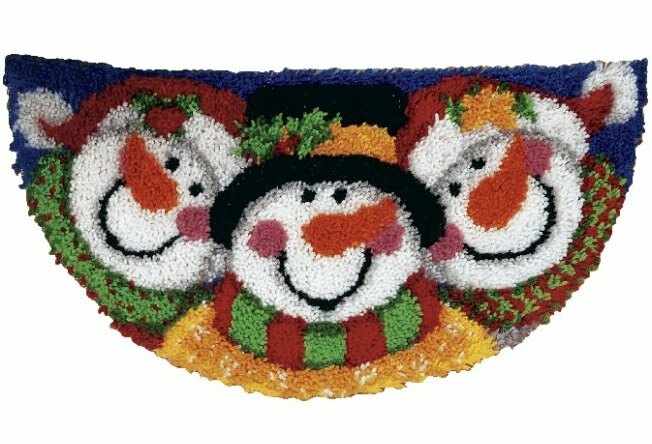 The Merry Men Christmas Latch Hook Kit from Caron is a colorful half-round rug hooking kit for the holidays. WonderArt latch hook kits include a color-coded canvas, pre-cut rug yarn, chart, and easy instructions. Latch Hooking is a great craft for beginners and will often bring back happy childhood memories for experienced crafters. 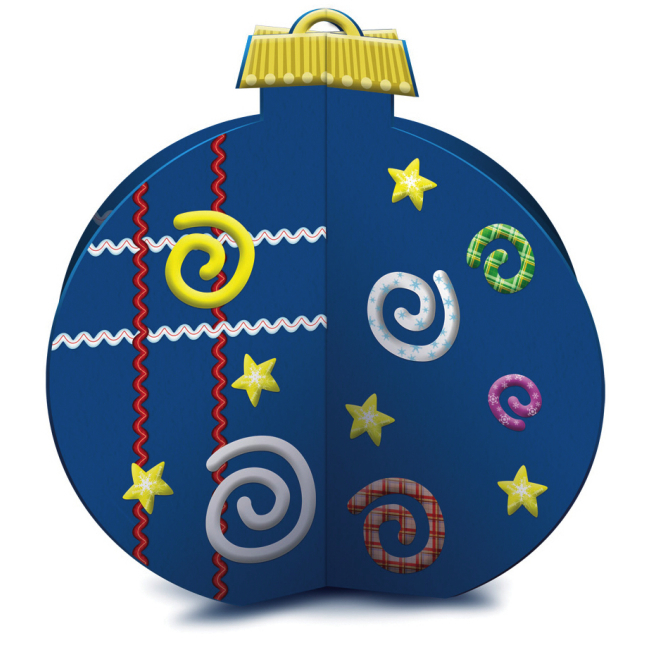 You'll have fun creating this plush half-round rug for the holidays! Visit the Christmas Craft Kits section for details on these kits and to see our complete section of craft kits for the holidays, including felt Christmas stocking kits, ornament kits, quilting kits, and more. Enjoy the convenience of a one-stop craft store. Weekend Kits offers a unique selection of Creative Craft Kits & Supplies for the holidays and all year long. Stop by today and be ready for your next Weekend at Home! 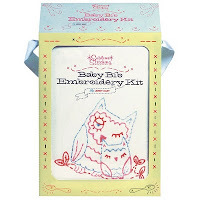 Our newest selection of Embroidery Kits are easy projects for baby. These kits make it easy to start embroidering right away. Kits include blank textiles, embroidery patterns, supplies, and instructions. You'll find them in the Hand Embroidery Kits section of the store! The Baby Bib Embroidery Kit by Jenny Hart is a delightful new embroidery kit from Sublime Stitching. Even if you've never embroidered before, this kit will surely inspire you to start stitching! Kit includes 2 ready-to-embroider baby bibs, 6 iron-on embroidery patterns, 5 skeins of floss, 1 needle, and a full-color, illustrated instruction booklet. 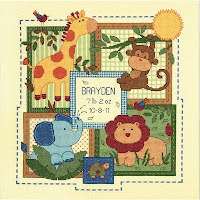 The adorable baby-themed embroidery patterns can be used multiple times, so you can embroider additional items for baby. Complete instructions make this an ideal embroidery kit for beginners. Jenny's illustrations make it easy, with clear diagrams showing how to complete each stitch. The pretty packaging makes this a great gift for new moms! 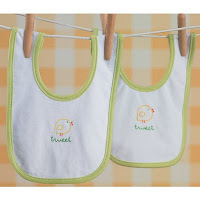 The Tweet Baby Bibs Embroidery Kit is part of a new line of stamped embroidery kits from Martha Stewart Crafts. 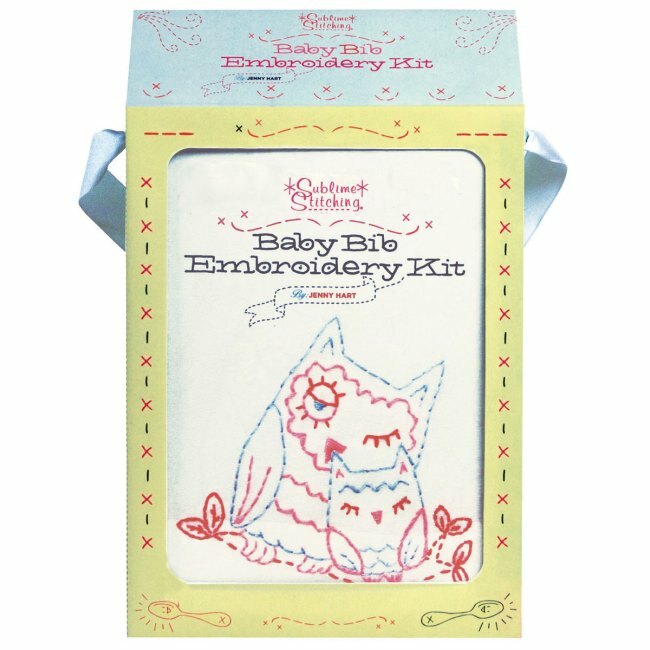 These embroidery kits include 2 stamped baby bibs, pre-sorted embroidery thread, needle, and easy instructions. This is an easy-to-stitch kit that is perfect for beginners! The bibs are pre-printed with an ink that will wash away, so there's no need to worry about any lines showing through your embroidery work. There's a matching Tweet Baby Set Embroidery Kit too! The baby chick motif and green trim color work perfectly for both girls & boys. The baby set includes 1 stamped cotton one-piece, 1 stamped cotton cap, pre-sorted embroidery thread, needle, and easy instructions. Stamped embroidery kits are pre-printed with the design, saving you the step of transferring the pattern to the textile. The simple embroidery pattern makes this a quick & easy weekend project! Visit the Embroidery Kits section for details on these kits and to see our complete selection of embroidery kits for beginners and experienced stitchers. 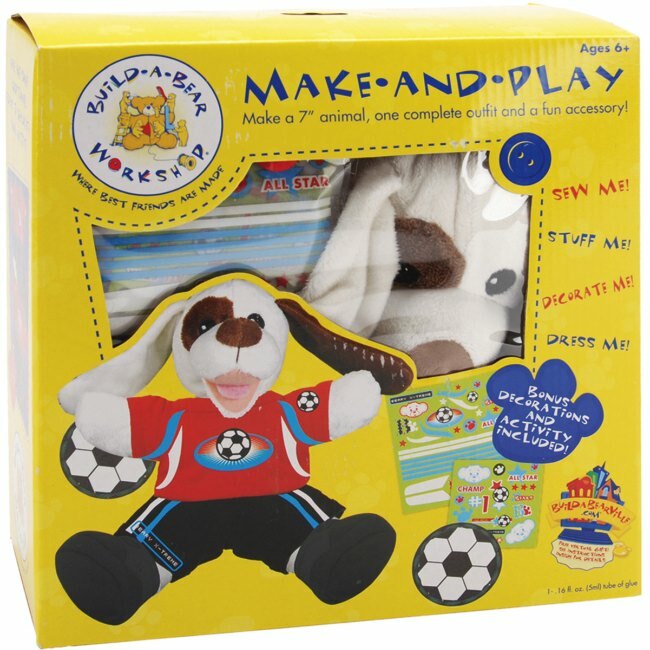 Stop by Weekend Kits today and be ready to embroider adorable projects for baby on your next Weekend at Home! We have a new selection of DIY Card Making Kits you won't want to miss! It's easy to create your own handmade greeting cards with the beautifully coordinated papers, envelopes, and embellishments included in these creative paper craft kits. You'll find them in the Card Making Kits section of the store! The Heartfelt Card Making Kit from TPC Studio contains all the paper craft materials you need to make 8 unique greeting cards. Kit includes 8 folded cardstock cards, 8 envelopes, 8 envelope liners, 2 cardstock punch-out sheets, 1 chipboard sticker sheet, 1 rub-on sheet with jewels, and easy card making instructions. Create your own card designs or follow the pre-designed card layouts provided with the kit. The variety of sentiments makes it easy to create everyday greeting cards for family & friends! The Jezebel Gypsy Card Making Kit is also from TPC studio's new line of easy-to-construct card craft kits. It includes all the necessary pieces to make 8 designer greeting cards for everyday occasions. You'll need to have a paper craft adhesive on hand when making your cards. Typical scrapbooking adhesives work very well for card making applications. Glue dots, glue sticks, double-sided tape, and tape runners are all good options. Card making is a creative paper craft activity for families to do together. An ideal rainy day craft project. You'll have fun as you spend time crafting & creating together! 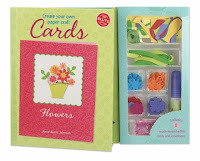 Learn how to create your own paper-craft cards with the Flowers Card Making Kit from Klutz. This kit includes a 27-page book with step-by-step card making instructions for beginners, 8 cards & envelopes, paper cut-outs, mounting squares, dimensional foam tape, glitter, glue, and wire. You'll have everything you need to create 8 unique cards with pretty flower embellishments. Klutz kits are always so nicely packaged with everything neatly enclosed. A crafty gift giving idea for preteens & teens! The time that you spend creating a custom handmade card for someone makes it that much more meaningful to give and to receive. Card making kits make it easy by bringing together all of the elements you need to create your own beautiful cards. Visit the Card Making Kits section to see our complete selection of card making kits for beginners and experienced crafters. We're going to be adding more kits to this section soon, so be sure to check back again for new product arrivals. Handmade crafts are perfect for holiday gift giving. Explore a variety of Creative Craft Kits at Weekend Kits and be ready to create something handmade on your next Weekend at Home! Beginner Art Kits - A Creative Gift Giving Idea! Art kits are a creative gift giving idea for birthday and holidays. 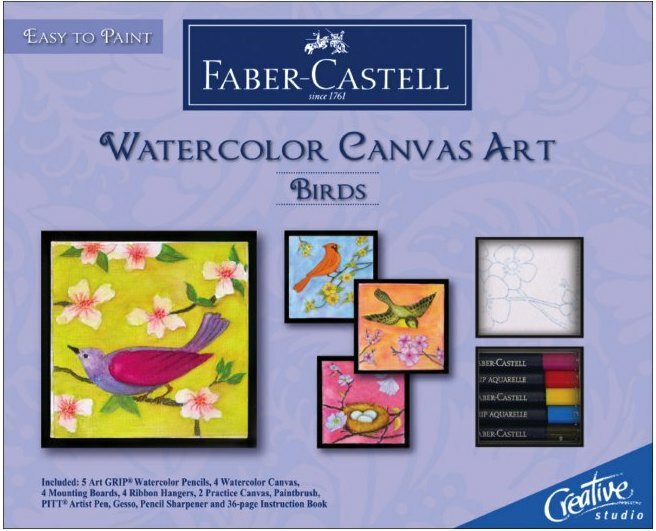 Complete kits include materials and instructions for beginners to learn how to paint & draw using a variety of mediums. See our complete selection of Beginner Art Kits in the Paint & Draw Art Kits section of the store! The following are a few of our newest art kit additions. Faber Castell's line of Creative Studio art kits are perfect for beginners. Watercolor Canvas Art kits include quality art materials and detailed instructions for creating beautiful watercolor paintings. The Birds Watercolor Canvas Art Kit includes 5 Art GRIP watercolor pencils, 4 pre-printed canvas boards, 4 foam mounting boards, practice canvas grids, pencil sharpener, watercolor paintbrush, ribbon & adhesive hangers, watercolor gesso, black PITT artist pen, and complete instructions. The process of creating watercolor canvas art is a lot of fun! The instruction book teaches the basic techniques you need to know to create your watercolor paintings. Simple step-by-step directions guide you through the drawing & painting process. This kit also includes mounting materials and ideas for displaying your finished works of art. 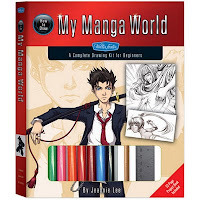 The How to Draw My Manga World Kit is a complete beginner drawing kit from Walter Foster. 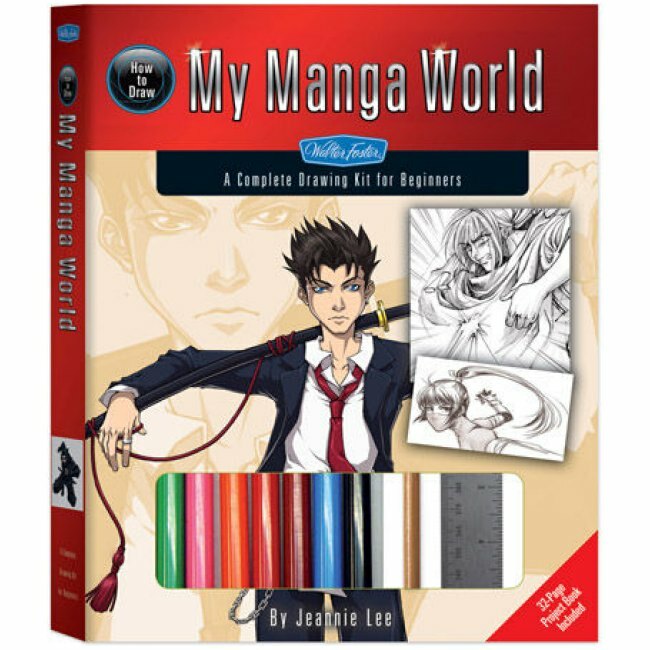 Manga art is so popular right now and this is the perfect kit for aspiring manga artists 13 yrs old & above. A great art gift giving idea for teens! Kit includes detailed instructions, colored markers, black permanent marker, drawing pencil, temporary tattoos, burnisher, bookmark, rubber eraser, screentone eraser, sharpener, and screentones. The 32-page project book teaches the basics of drawing manga art characters and scenes. Step-by-step lessons allow the beginner artist to apply their new drawing skills to creating their own style of manga art. 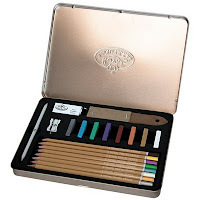 The Pastel Pencil Art Set contains quality pastel art supplies from Royal Brush. 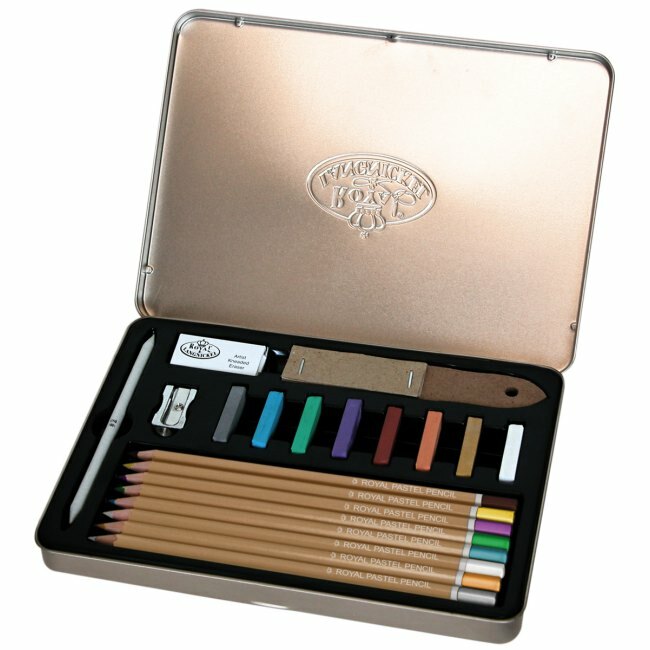 This is an affordable pastel art starter set for beginners! Kit includes 8 pastel pencils, 8 soft pastel sticks, a blending stump, kneaded eraser, sharpener, and sanding block. All of the art supplies are packaged in a reusable art storage tin. Nicely package for gift giving. 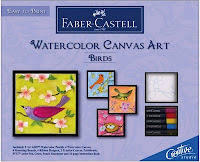 Visit the Paint & Draw Art Kits for details on these kits and to see our complete selection of art kits for beginners. You'll find a nice selection of kits for learning how to paint & draw using a variety of art mediums, including oils, acrylics, watercolors, pencils, and pastels. Explore a unique collection of Art & Craft Kits at Weekend Kits and be ready for a creative Weekend at Home! Bucilla Felt Christmas Stocking Kits - New Selection! 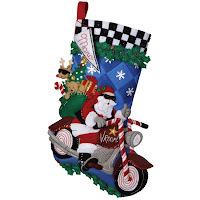 We have a new selection of Felt Christmas Stocking Kits for the 2010 holiday season. They're quality Felt Applique Kits from Bucilla, a well known & trusted brand name in the crafting industry. You'll find them in the Christmas Craft Kits section of the store! The Princess Felt Stocking Kit is a lovely Christmas stocking design, perfect for girls of all ages! The Princess is dressed in a beautiful Christmas gown and appears to be leaving the Castle to attend a starlight Christmas ball or other special holiday occasion. This Bucilla felt applique stocking kit include stamped felts, cotton floss, metallic thread, sequins & beads, needles, and instructions. Handmade felt Christmas stockings become treasured keepsakes. My daughters love their felt stockings and look forward to bringing them out every holiday season. The Cruising Santa Felt Stocking Kit is a cool Christmas stocking design, perfect for boys of all ages! This Bucilla felt stocking kit includes all of the materials and instructions you need to make this creative Christmas stocking for a loved one to enjoy every holiday season. You'll want to have a pair of precision craft scissors on hand for cutting out the felt pieces in your kit. Some of the felt pieces are small and have intricate shapes. 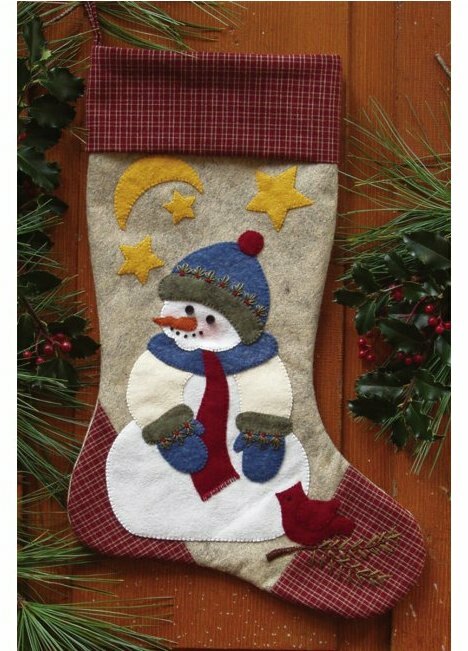 The Woodland Snowman Felt Stocking Kit is a new 2010 Christmas stocking design from Bucilla. 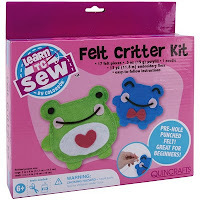 Kit includes stamped felts, cotton floss, sequins & beads, needles, instructions, and directions for personalization. Your finished felt stocking will be approximately 18-inches long. Fall is the perfect time of year to get started on your felt Christmas craft projects. The kids & grandkids are back in school, the weather is cooling down, and there's still some quiet time left before the holiday rush is upon us. Some of the stocking kits will take longer to make than others. It really depends on the complexity of the individual design. If you're short on time, look for stockings that have fewer pieces to applique and less detailed embroidery work. If you do have the time to spend on one of the more detailed kits, you won't be sorry. The results are truly amazing! 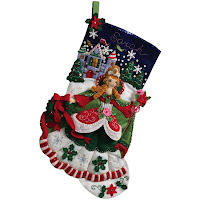 And, because Bucilla stocking kits use quality materials, your handmade felt stocking will stand the test of time. 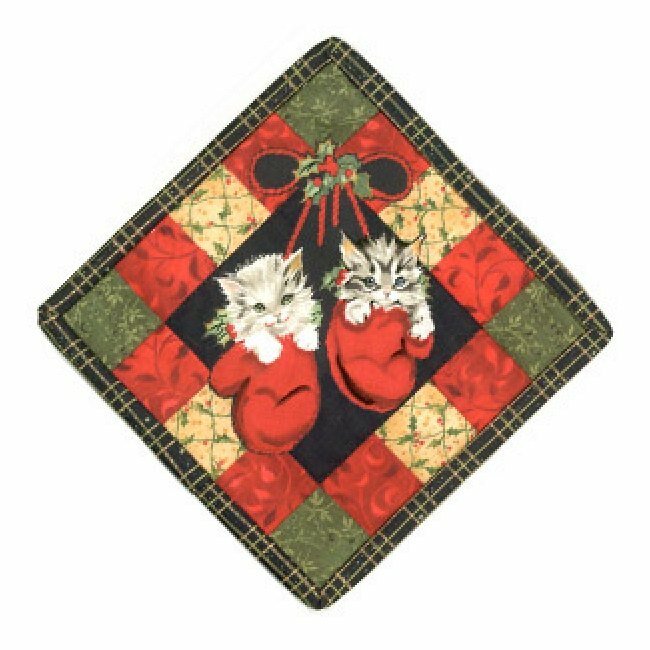 Visit the Christmas Craft Kits section of the store to see our complete selection of felt applique craft kits, including stocking kits, ornament kits, tree skirt kits, and more. Weekend Kits offers a wide variety of Creative Craft Kits for the Christmas season and all year. Stop by today and be ready to start crafting for the holidays on your next Weekend at Home! You won't want to miss our newest selection of apron sewing patterns! They're flattering & fun apron designs from Indygo Junction. You'll find them in the Apron Patterns section of the store. 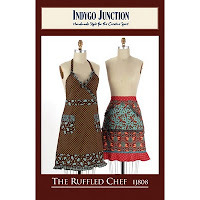 The Ruffled Chef Apron Pattern is a fashionable apron design with feminine ruffled accents. This apron is made using four coordinating fabrics. The full apron has a ruffled halter style bodice that ties at the neck and a pretty ruffled hem. The half apron features pocket ruffles and a flounce around the hemline. 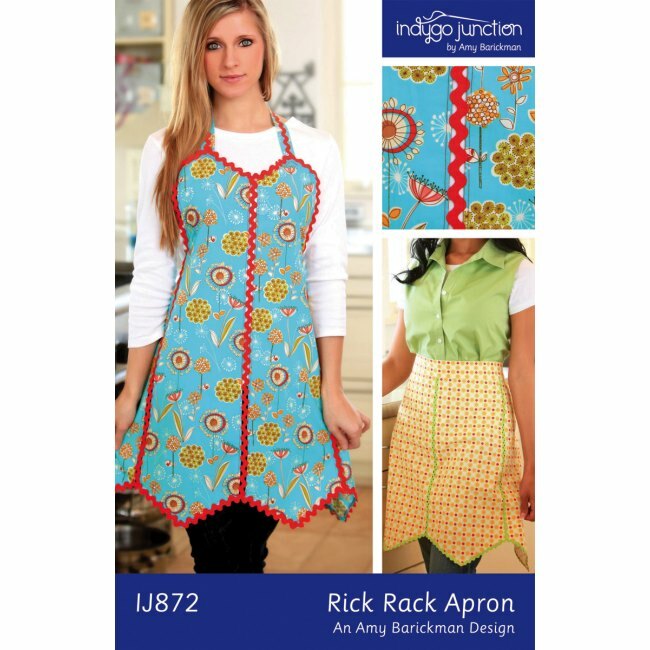 This flattering apron design has the look of a stylish sundress or classic A-line skirt. So pretty, you could wear this apron as a pretty fashion layer for a day on the town! The All Day Apron Pattern is a new apron sewing pattern by Amy Barickman. Just as the name suggests, you'll want to wear this comfortable apron all day. Wear to keep your clothes clean while cooking, cleaning, and crafting. The figure flattering design features a flirty ruffled hem, bias trimmed neckline, and patch pocket. Apron pulls over the head and ties in the back with a bow. This apron sewing pattern uses two coordinating fabrics. Choose 1-1/4 yards of 44" wide fabric for the main body of the apron and 1 yard of 44" wide fabric for contrasting trim, ties, and ruffle. The Rick Rack Apron Pattern is a fun apron sewing pattern that includes options for making the full and half apron versions. 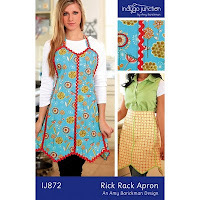 If you love retro & rickrack, then this is the apron for you! This is the perfect apron for those retro reproduction fabrics you see in all the fabric stores. Colorful rickrack accents the seams. A great apron for layering over a favorite pair of jeans and t-shirt! Apron sewing pattern calls for 1 yard of 45" wide cotton fabric and 4-6 yards of medium or jumbo rick rack. Two sizes are included. Making an apron is an ideal weekend sewing project. Most apron sewing patterns use minimal pattern pieces, are easy to sew, and fit a range of sizes. Handmade aprons are a fun handmade gift to give friends & family. Select themed fabrics for the holidays or fun fabrics to match a friend's personality! Visit the Apron Patterns section for details on the new Indygo Junction sewing patterns and to see our complete selection of apron patterns. You'll find apron patterns from a variety of apron designers, including The Apron Lady, Sew Liberated, Paisley Pincushion, Taylor Made, and more! No time to sew? 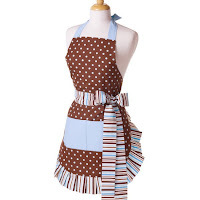 You'll find a nice selection of ready-to-wear aprons in the Gifts for Crafters section. 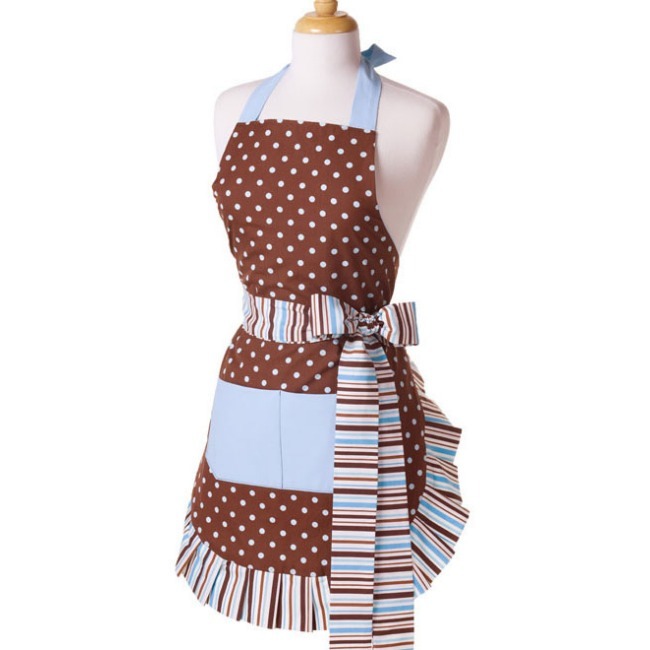 Woman's aprons from Flirty Aprons are available in three color choices - Sassy Black, Blue Chocolate, and Pink Chocolate. You'll also find Little Girl's designer aprons from Jessie Steele. 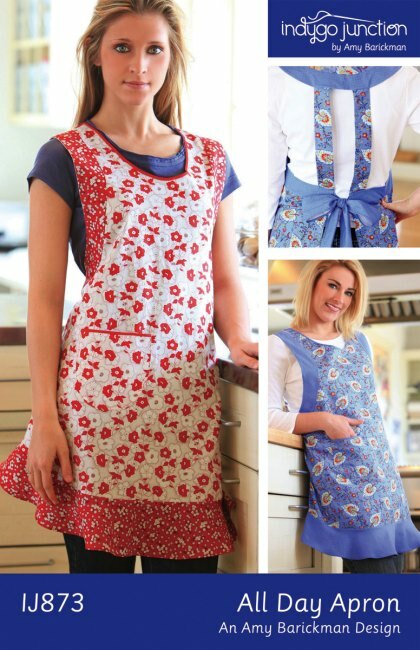 Choose from three retro apron styles, including the Cupcakes Apron, Retro Cherries Apron, and 50's Kitchen Apron. Stop by Weekend Kits today to explore our growing selection of Craft Kits & Supplies across a variety of Arts & Crafts categories, including sewing, quilting, embroidery, knitting, and much more! Klutz Craft Activity Kits are the perfect choice for beginners. All of the Klutz craft kits include a quality how-to instruction book and the craft supplies you need to make a variety of creative projects. 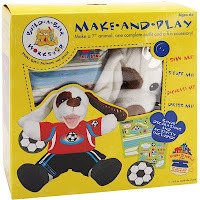 Klutz kits make it easy to learn a new craft and create something new! Our newest selection of these Creative Craft Kits will help kids & teens get started crafting with confidence. You'll find them in the Kid's Craft Kits section of the store! 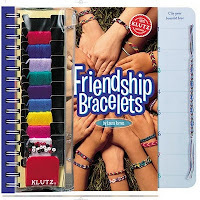 The Friendship Bracelets Kit is a complete jewelry making kit with everything you need to start making a variety of colorful friendship bracelets! 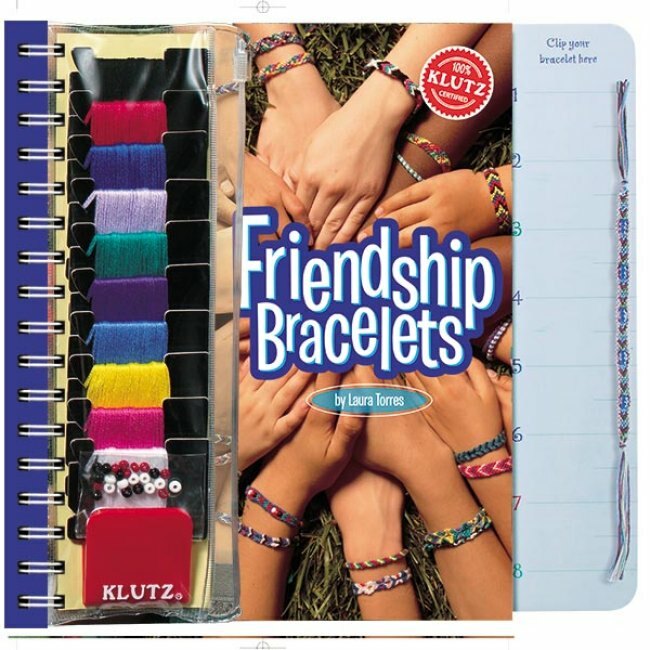 Klutz craft books provide amazingly-clear step-by-step instructions & diagrams and the Friendship Bracelets how-to book is no exception. This kit includes a 60-page color instruction book that teaches the basic knotting techniques and provides detailed tutorials for making 10 different bracelet patterns. The zippered pouch on the front holds 10 colors of embroidery floss, a small package of beads, and the Klutz clip. You'll use the clip to hold your bracelet steady while you're working on it. The right side of the book extends out and doubles as a clipboard. Convenient for crafting on the go! The Hemp Bracelets Kit includes 150 feet of natural fiber hemp, a nice assortment of beads, and a 34-page instruction book. Beautiful color photos are shown throughout the book. Detailed illustrations show the knotting techniques used to make 10 different styles of hemp bracelets. 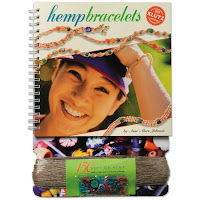 You'll also learn how to add beads to your hemp bracelets. Kids will have fun learning how to make these casual & sporty bracelets to wear everyday! 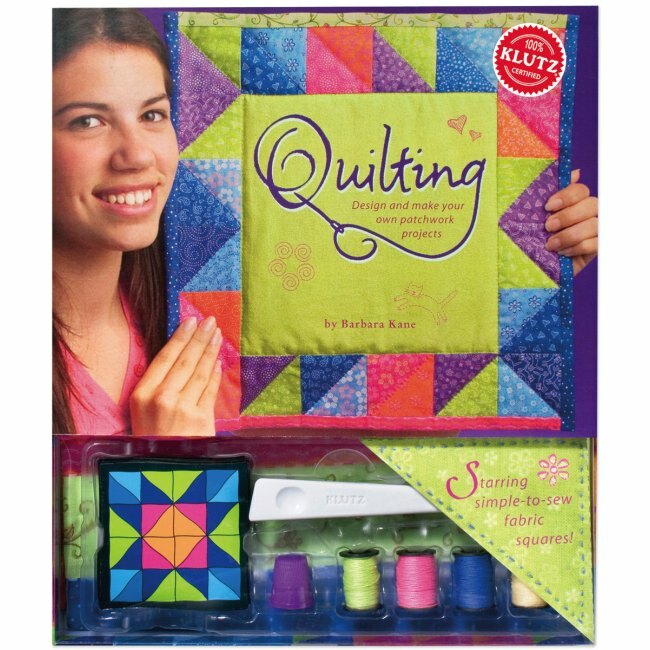 The Klutz Quilting Kit includes instructions & supplies for making a variety of creative patchwork quilt projects. 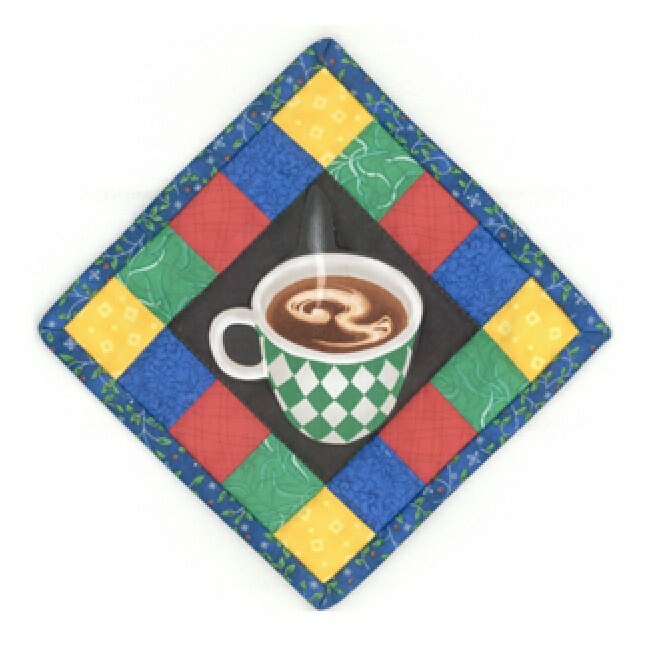 This is a complete quilt kit for beginners. Kit includes a 63-page beginner quilting book, 100% cotton fabric, quilt batting, pressing tool, design cards, thread, needles, pins, and seam allowance templates. Detailed instructions guide you step-by-step through the quilting process. The kit includes material for making your first quilt projects. Learn how to quilt a patchwork pillow, shoulder bag, wall hanging, and more! Klutz kits are always beautifully packaged, making them the perfect gift to give for birthdays & holidays. Visit the Kid's Craft Kits section for details on these kits and to see our complete selection of creative craft kits for kids. Klutz activity kits make learning a new craft easy & fun! Weekend Kits offers a unique selection of Craft Kits & Supplies for kids, teens, and adults. Stop by today and get ready to learn a new craft on your next Weekend at Home! Thank you for visiting the Weekend Kits Blog. Mini quilt kits are a great choice for beginners! You'll still learn all the basic steps involved in quilting, but the smaller size makes them much easier for new quilters to handle. 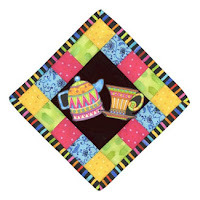 We recently added a new selection of colorful & fun Mini-Magnet Quilt Kits from Quilt in a Day. You'll find them all in the Mini Quilt Kits section of the store! Mini-Magnet Quilt Kits include all the materials you need to complete a mini wall hanging quilt. Kit includes pre-cut fabric strips, center picture fabric, batting, backing, binding, magnet, and detailed instructions. A small magnet is placed in the cornerstone of the mini quilt for easy display on any metal surface - perfect for decorating the fridge! These little quilts are quick, easy, and fun to make. You won't be able to stop at just one. Beginners will appreciate the step-by-step instructions and helpful diagrams that take you through the process of completing the mini quilt project. Steps include piecing the quilt top together, assembling the quilt layers, and binding the outer edges. Great for teaching children, teens, and adults how to quilt & sew! Each mini quilt includes a picture in the center of the quilt. This picture is provided on fusible web, making it easy to iron in place prior to stitching. 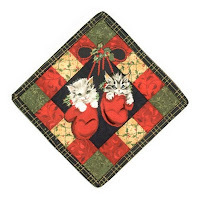 You'll find a nice selection of holiday-themed mini quilt kits, including Christmas quilt kits and Thanksgiving quilt kits. Perfect for handmade holiday gift giving! A few basic quilting supplies you'll need to have on hand include a sewing machine, rotary cutter & mat, quilting pins, and thread. 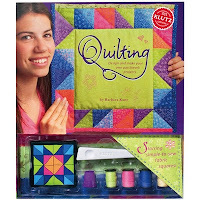 Mini quilt kits are a convenient choice for busy crafters. Pre-cut fabric strips in coordinating colors save a lot of time and you don't have to buy more fabric than you need. 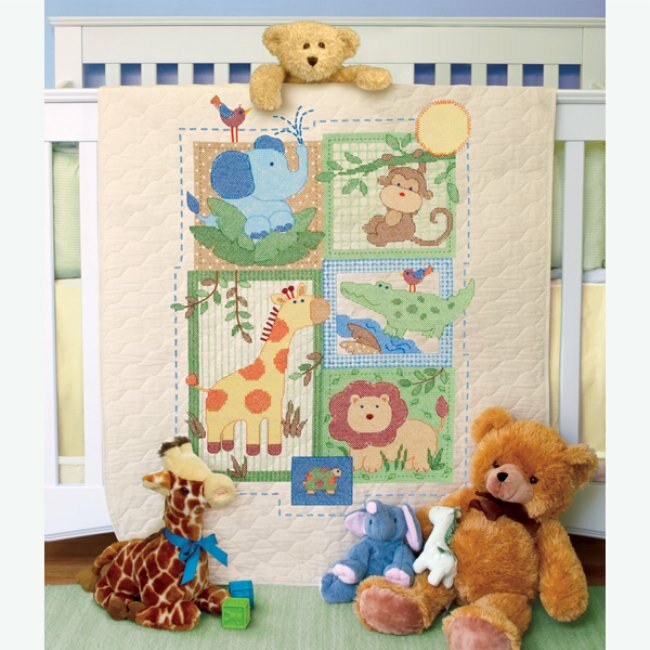 Visit the Quilt Kits section for details on our new mini quilt kits and to see our complete selection of quilt kits, including baby quilt kits, lap quilt kits, and wall hanging quilt kits. Weekend Kits offers a wide range of Creative Craft Kits for all ages to enjoy. Stop by today and be ready to create something new on your next Weekend at Home! 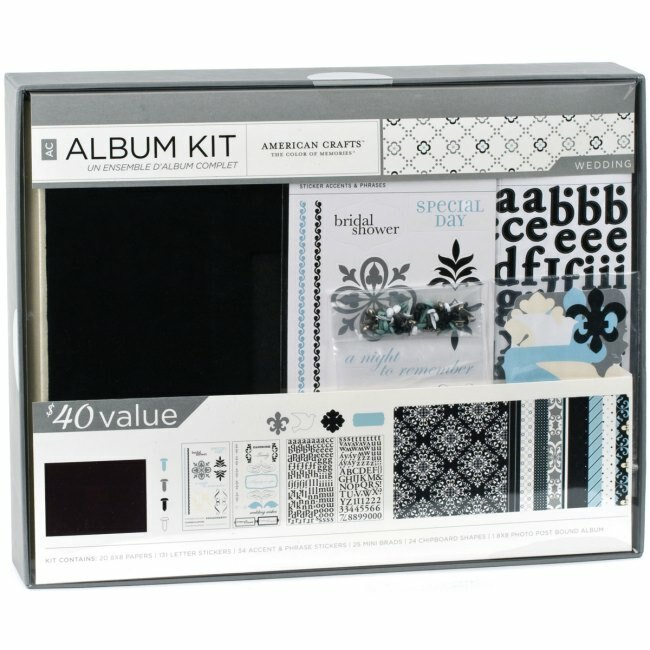 Themed Scrapbook Kits for Beginners & Busy Scrapbookers! Our newest selection of themed scrapbook kits are the perfect choice for beginners and busy scrapbookers! 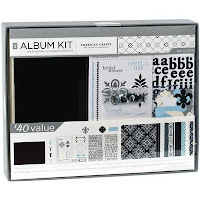 Complete scrapbook kits from American Crafts include coordinating album, patterned papers, and embellishments for creating a designer scrapbook. You'll find them in the Scrapbook Kits section of the store! 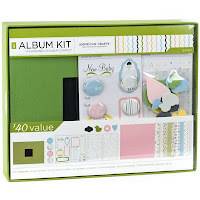 The Baby Scrapbook Kit includes one 8x8 post-bound album, 10 page protectors, 20 sheets of patterned paper, 24 foam shapes, 310 letter stickers, 10 journaling stickers and 4 flair adhesive badges. The papers are sized to fit inside the page protector sleeves. You can click on the images to get a better view of the patterned scrapbook papers included in each of the kits. The album is covered with a leaf green fabric that will work well for either a baby girl or baby boy. The photo window frame on the front cover makes it easy to personalize your album with a favorite photo of baby. 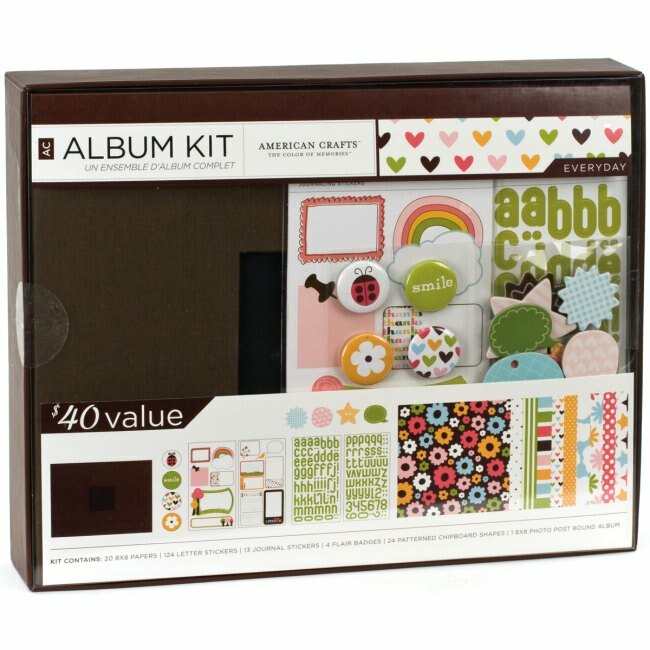 Baby scrapbook kits are a creative baby shower gift to give a crafty friend! The Wedding Scrapbook Kit is perfect for creating a keepsake album of your wedding day! Kit includes one 8x8 post-bound album covered with classic black fabric, 10 page protectors, 20 sheets of patterned paper, 24 chipboard shapes, 171 letter stickers, 34 accent & phrase stickers and 25 mini brads. Include photos of special pre-wedding events too, including the engagement party, bridal shower, rehearsal dinner, and more. Adding embellishments is a great way to enhance your layouts and it's a lot of fun! 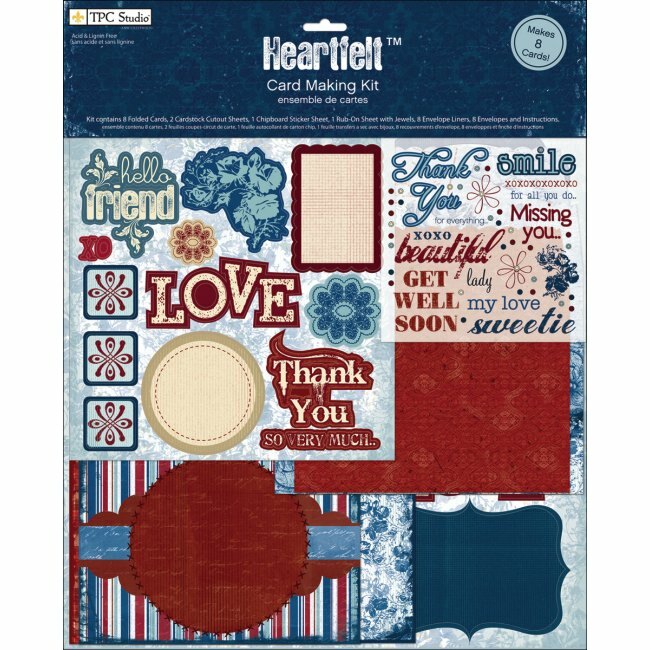 The American Crafts album kits include a generous assortment of coordinating embellishments for decorating your scrapbook pages. The Everyday Scrapbook Kit is the perfect choice for highlighting special photos of everyday life with family & friends. Kit includes one 8x8 album, 10 page protectors, 20 sheets of paper, 24 chipboard shapes, 124 letter stickers, 13 journaling stickers and 4 flair adhesive badges. The post-bound album is covered with a chestnut brown fabric. Papers and embellishments are perfectly coordinated with modern colors & trendy designs. Use this all-occasion scrapbook kit to share photos of best friends, birthdays, vacations, and more! Visit the Scrapbook Kits section for details on these kits and to explore our complete selection of scrapbook kits for beginners & experienced scrapbookers. We've added some new supplies to the Paper Craft Supplies section of the store! Our goal is to bring you quality products at a great value. 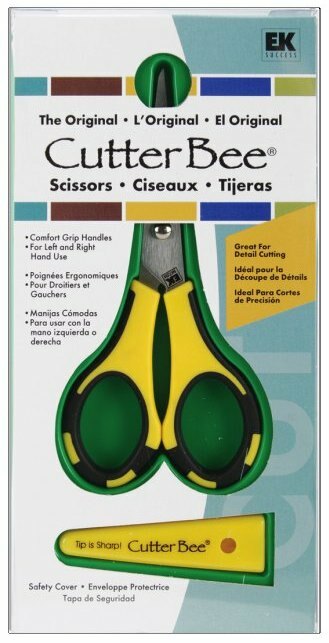 The Original Cutter Bee Scissors from EK Success are a great choice for a variety of scrapbooking & card making applications. These precision cut scissors are ideal for detail cutting. The comfort grip handles work for both left and right hand use. A snap-on safety cover is included. The ZIG Writer Scrapbook Marker features a dual tip and black pigment ink that has been tested for archival quality. This is a great all-purpose marker for scrapbook journaling. This marker is acid-free, light-fast, waterproof, fade-proof, and non-bleeding. Kits make it easy to create a designer scrapbook album for special occasions & everyday! Explore a variety of Creative Craft Kits & Supplies at Weekend Kits and be ready to start scrapbooking on your next Weekend at Home. It's easy to make beautiful jewelry at home with our new selection of beaded jewelry kits from Prima Bead. These unique jewelry kits feature creative jewelry designs & quality materials. You'll find them in the Jewelry Making Kits section of the store! The Sea Glass Bracelet Making Kit features sterling silver beads & findings, frosted glass beads, and sparkling crystals. 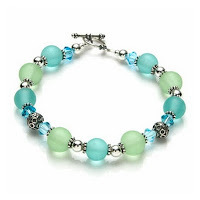 This beautiful bracelet uses calming sea glass inspired colors, including aquamarine blue, lime green, and light teal. Prima Bead jewelry kits use only the finest materials. The findings used in this lovely bracelet are authentic sterling silver. The crystals are genuine Crystazzi brand bicones. This easy bracelet project includes all the beads & findings you need to make one 7-1/2" bracelet with toggle style closure. Perfect for wearing with your favorite pair of blue jeans & t-shirt for a dressy casual look. The Gold Forest Earring Making Kit includes all the materials you need to make these gorgeous crystal & glass pearl earrings. 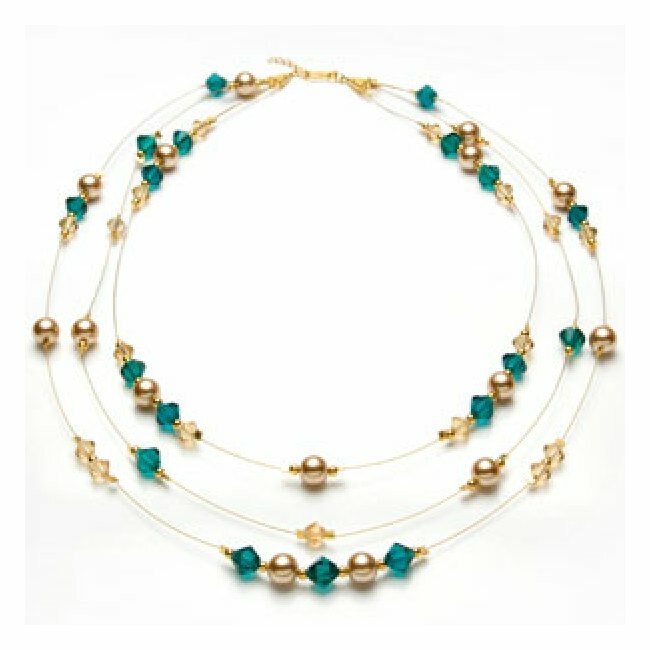 The 14K gold plated beads & findings coordinate beautifully with the forest green crystals and soft gold pearls. 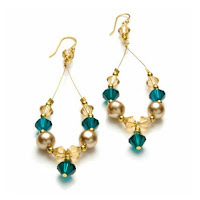 Step-by-step instructions & diagrams are provided with all Prima Bead jewelry kits. Basic jewelry making techniques are used to create each of the jewelry pieces. This easy earring project requires that you know how to form wrapped loops and apply crimp beads. An ideal jewelry making project for beginners with some experience. Advanced jewelry crafters will enjoy the convenience of professionally coordinated beads & findings! The Gold Forest Necklace Making Kit is a 3-strand crystal & glass pearl necklace kit designed to match perfectly with the Gold Forest earrings. Kit includes 14K gold plated beads & findings, genuine Crystazzi crystals, and lustrous glass pearls. You'll need to have some basic jewelry making tools on hand to complete your Prima Bead jewelry projects. This necklace project requires the use of crimping pliers and wire cutters. The product descriptions provided for each of the jewelry kits tell you which jewelry tools you'll need as well as which techniques are used in making the jewelry project. 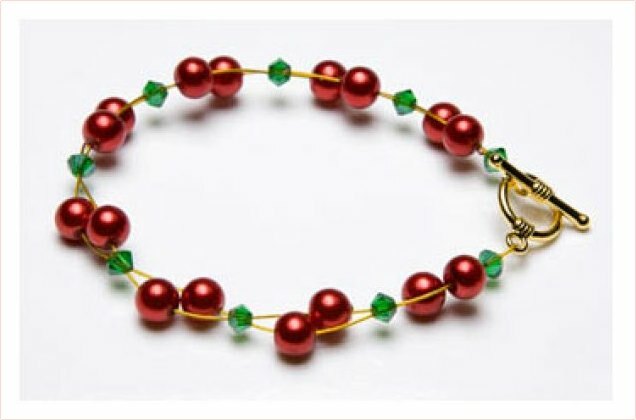 The Christmas Holly Bracelet Kit is a holiday jewelry kit with all the jewelry supplies you need to made one holly bracelet. 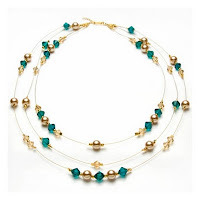 Kits includes 14K gold plated toggle accents, gold bead wire, crystal bicones, glass pearls, and instructions. Wear this fun bracelet to a special Christmas gathering or just for fun throughout the holiday season. Holiday jewelry kits are also a great way to create special jewelry items for handmade gift giving! The Christmas Lights Earring Kit is another fun holiday jewelry kit you won't want to miss. Crystal tear drops and sterling silver accents make these earrings sparkle! Visit the Jewelry Making Kits section for details on all the jewelry kits shown here and to see our complete selection of jewelry making kits for all skill levels. If you're new to jewelry making, be sure to explore our great selection of jewelry kits for beginners too. Explore our fun & always-changing selection of Creative Craft Kits & Supplies at Weekend Kits and be ready to create something new - like beautiful jewelry - on your next Weekend at Home! Thank you for visiting the Weekend Kits Blog, where you'll always be the first to learn about What's New at Weekend Kits! Beginner Embroidery Kits - Learn to Embroider! Our newest selection of beginner embroidery kits use simple patterns & basic stitches, ideal for learning how to hand embroider. You'll find them in the Embroidery Kits section of the store! The Simply Stitched line of hand embroidery kits from Janlynn are perfect for beginners! Each kit includes foundation fabric, embroidery floss, needle, and instructions. 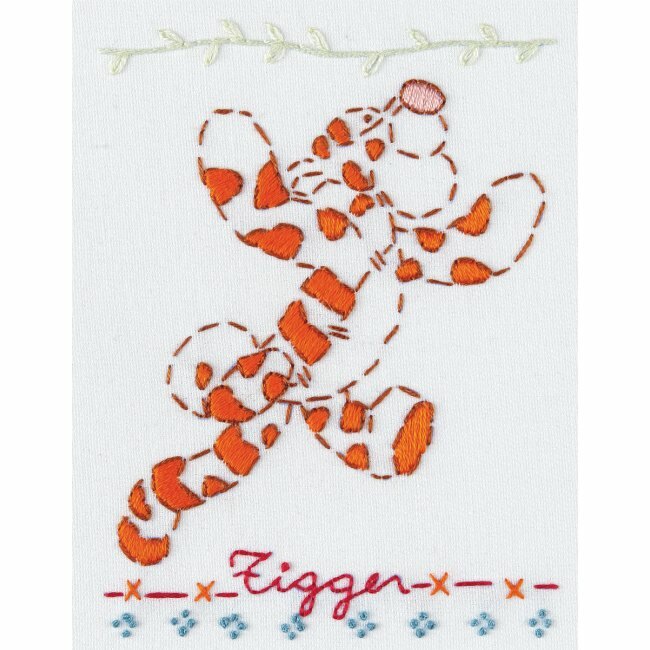 There are 3 Simply Stitched embroidery designs featuring classic Winnie the Pooh characters, including Pooh, Tigger, and Eeyore. These delightful designs show us that sometimes simple is better. 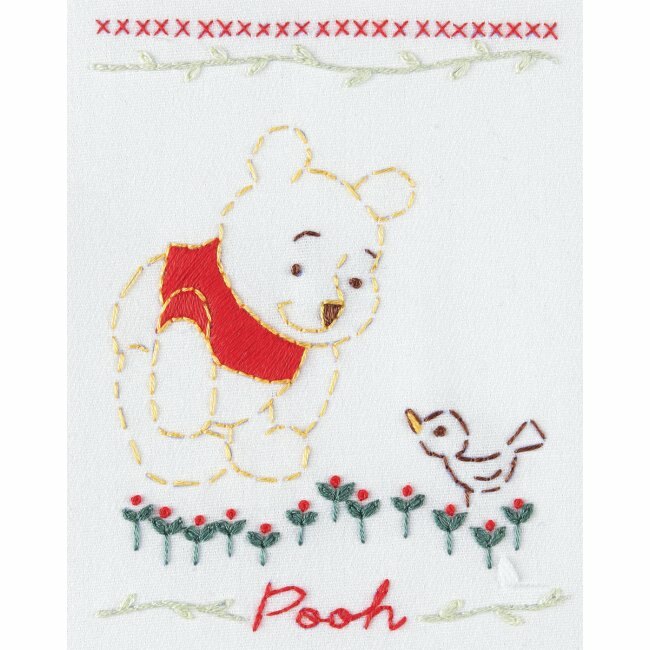 The Pooh embroidery design would be perfect framed for baby's nursery or a young child's bedroom. The Simply Stitched designs are pre-printed on the fabric, so there's no need to worry about transferring patterns. You'll be ready to start stitching right away! A few embroidery supplies you'll want to have on hand include an embroidery hoop to hold your fabric while stitching and a pair of sharp scissors for snipping threads. The simple designs make these kits a quick & easy embroidery project for experienced stitchers. Great for handmade gift giving! This is the perfect embroidery design for anyone who loves Tigger. And, don't miss the always-lovable Eeyore - Simply Stitched Embroidery Kit. The Hummingbird Duo Counted Cross Stitch Kit is from the Learn-a-Craft line of beginner embroidery kits from Dimensions. 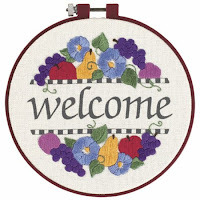 Kit includes white cotton Aida fabric, embroidery hoop, cotton floss, needle, and instructions. With counted cross stitch, the design is not pre-printed on the fabric. You'll learn how to count the threads in the fabric to find the correct location for each of the X-shaped stitches. Counted cross stitch charts show you where to place individual stitches and provide symbols for selecting the appropriate thread color. I find that using a highlighter pen is a helpful way to keep track of where you are on the chart, especially if you have to leave your project for an extended time. The Welcome Butterfly Counted Cross Stitch Kit is a colorful cross stitch design for beginners! 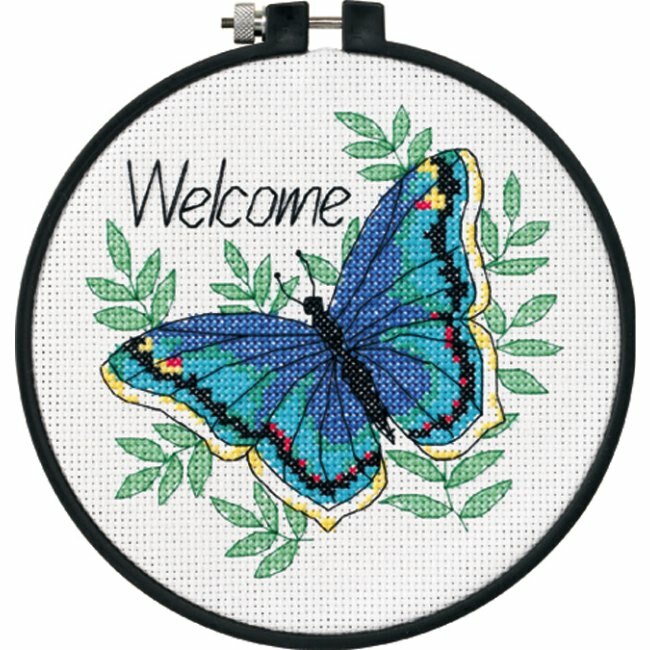 The 6" plastic hoop included in the kit can be used to frame your completed needleart for easy display. The new Learn-a-Craft Kits include pre-sorted thread organizers! This means that each of the floss colors are separated and identified by color number. The organizer also shows how many strands of floss to use when using a particular color. Cotton floss is provided in 6-strand threads and must be pulled apart to use only the number of strands indicated by the cross stitch chart. Visit the Embroidery Kits section for details on these kits & to see our entire selection of embroidery kits for beginners and experienced stitchers, including hand embroidery kits, crewel kits, cross stitch kits, beaded stitch kits, and more! If you love embroidery, you won't want to miss a visit to the Feeling Stitchy blog. This crafty blog is full of embroidery inspiration, including great tutorials, free patterns, creative embroidery projects, and more! I especially like the helpful stitching resources they provide, including links to a stitch dictionary, stitch school, and even a video library of stitches. This is an excellent embroidery resource! Embroidery is a relaxing craft with design options ranging from classic to contemporary. Stop by Weekend Kits today and be ready to start stitching on your next Weekend at Home.